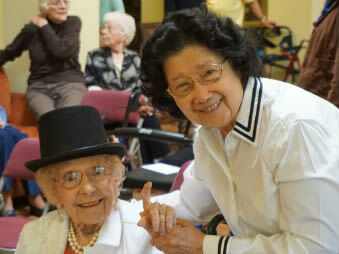 As part of the Ray Stone Senior Living family, our motto is, Worry Less, Smile More. Residents of Winding Commons can forget about clogged gutters, leaky pipes, and creeping weeds, we handle all the maintenance. Our staff keeps the grounds beautiful, and your apartment home in tiptop shape. Weekly housekeeping and linen service free up the day for more enjoyable pastimes. You can leave the driving and parking to us, or make use of available on site covered parking. Winding Commons is designed for choice, whether you want to join your neighbors for a game of cards, take care of errands in town, or relax on your private patio or balcony. Stretch your creativity with an arts and crafts class, or your muscles with daily fitness classes. Learn about history or finances from one of our featured speakers. Or simply enjoy the California sunshine strolling along walking paths along the waterways with your small pet. Excellent medical care is minutes away from Winding Commons Senior Living. In addition to Mercy San Juan Hospital, there are services and specialists throughout the immediate area. Along with our Health speaking series, our chef will share healthy eating options during his monthly Food Facts presentation. For peace of mind right at home, every apartment home is equipped with emergency pull cords, with 24-hour staff response. Contact our office to schedule a visit. We are eager to answer your questions about premier senior living at Winding Commons of Carmichael.